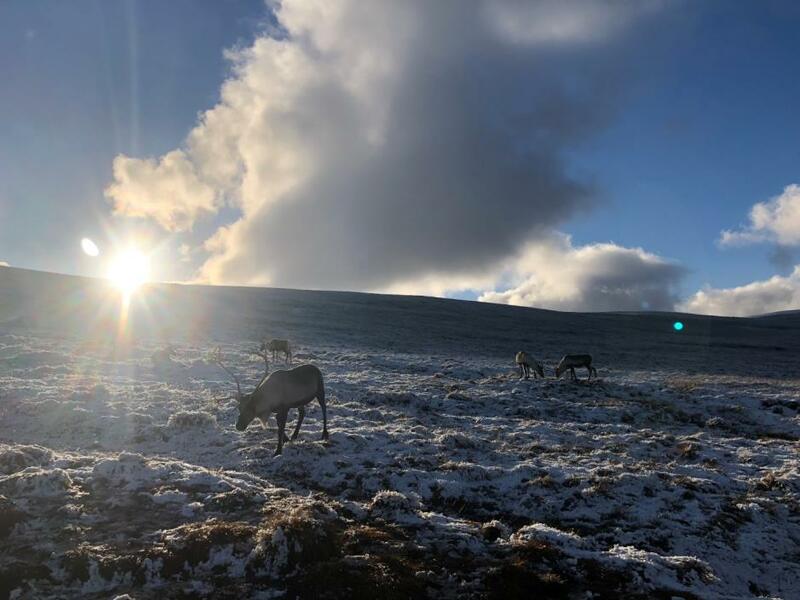 One year after spending Thanksgiving as the lone American in Nepal with a group of runners that included Fiona Smith, I could have never imagined that I would be cooking Thanksgiving dinner for a group of reindeer herders in the Scottish Highlands. Nonetheless, here I am, still the lone American, but with a whole bunch of great friends surrounding me and accepting me as the, ‘token yank’. My road to becoming a reindeer herder was unconventional to say the least. 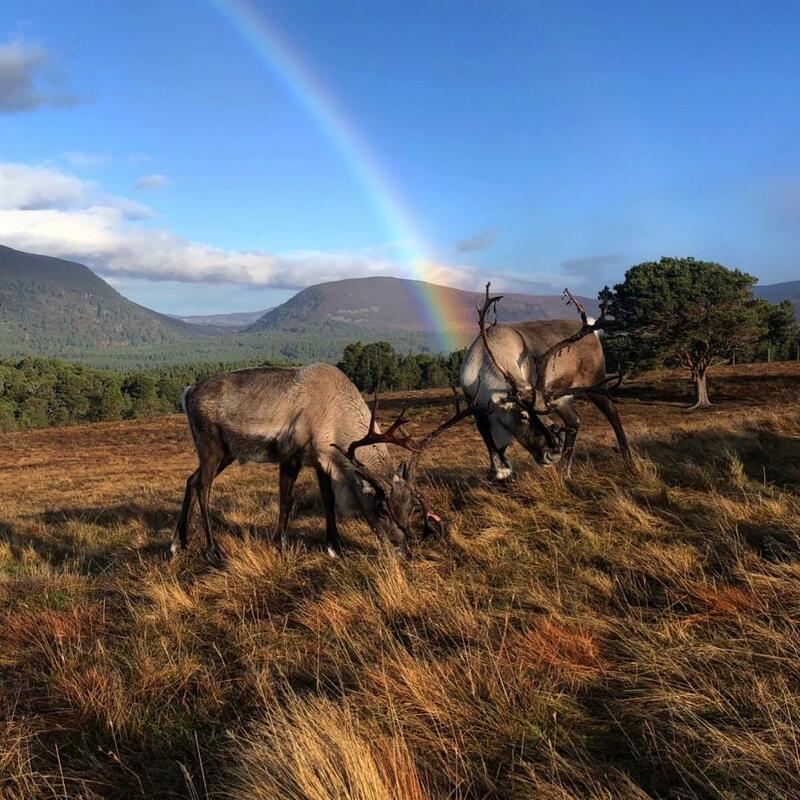 Actually, is there really any conventional way to end up working at the Cairngorm Reindeer Center? And yep, that is Center spelled with an ‘er’ at the end because there are just some things that I refuse to conform to including British spelling of certain words. So if you receive an adoption pack describing your reindeer’s ‘color’ you can bet that I wrote it. It all began last November while in the Himalaya finishing up my mission to run a marathon in every continent, and Asia was my last one. I was part of an expedition running the Everest Marathon, a group that included the one and only reindeer extraordinaire, Fiona Smith. When we were doing our introductions on the first few days of the trek, I honestly thought that she was joking when she enlightened us all to her incredibly unique profession. C’mon now, no one actually herds reindeer for a living? They just sit at the North Pole and eat carrots; no one looks after them but Santa. Boy, was I wrong. I knew virtually nothing about these incredible animals and the amazing people that take care of them here in Scotland. Fast forward to this past July, Fiona, our friend Tom from the Everest Marathon, and former reindeer herder Ruth Molloy found themselves on a plane to America to join me on my hike of the Appalachian Trail (AT). And for about a week, they all enjoyed the delightful experience of arduously trudging through the muddy hemlock forests of Vermont. Anytime you meet someone while traveling, you know them in a very isolated context, so it becomes quite odd when you see them outside of that original encounter. 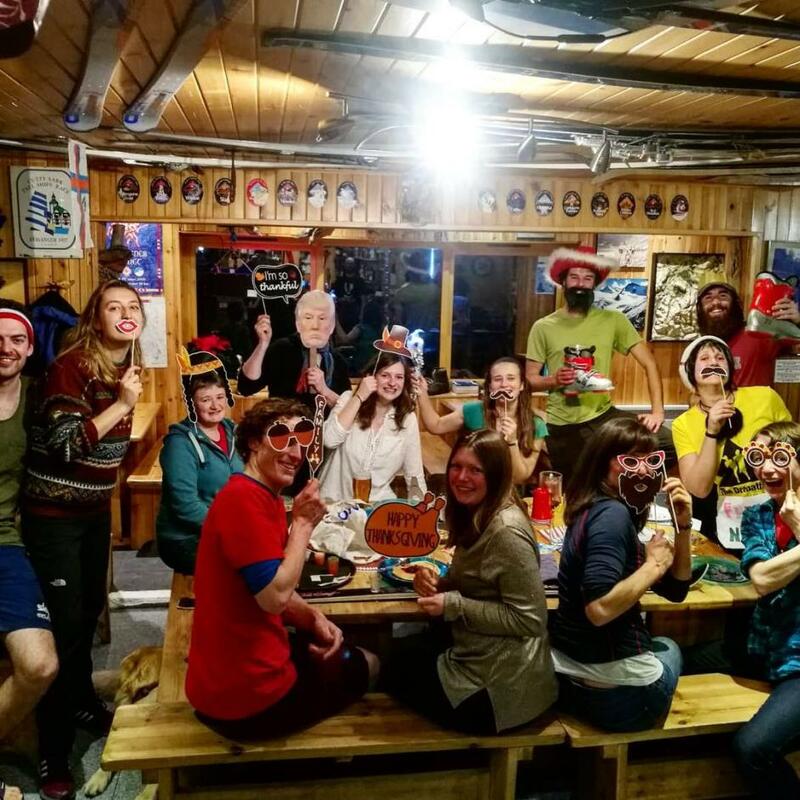 However, when participating in something like the Everest Marathon, it enables you to create a bond with people that transcends far beyond what is normal. Because of this we stayed in close communication in the months following our journey through the Himalaya. When I had first told them that I would be hiking the Appalachian Trail, they must have done little to no research because they were quite keen to join me! 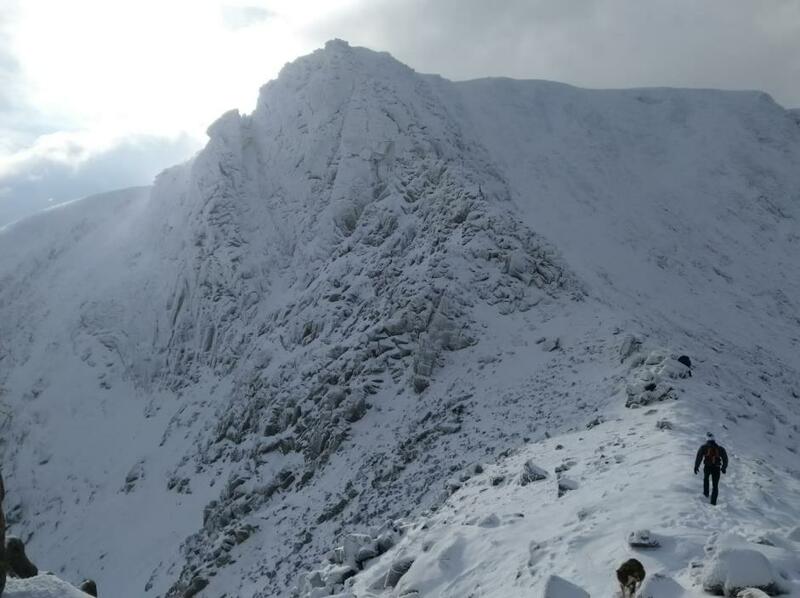 While we all hiked there were many jokes made on my behalf regarding my homelessness and unemployment, simply living in a tent for five months in the mountains of the east coast of the United States. These jokes however, led to an offer that seemed to be taken more seriously as the days on the trail with Fiona and company went on. 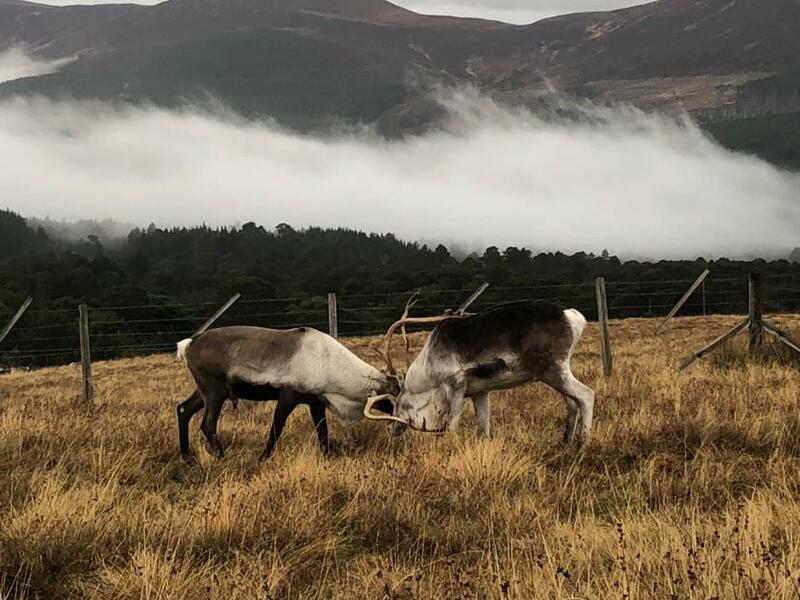 She suggested that when I had finished hiking, if I would like to visit her in Scotland, I’d be welcome to come help out at the Reindeer Center for November and December. The Christmas season tends to be a busy time of year for reindeer (I at least knew that), so they always welcome an extra set of hands. Next thing I knew, I had myself a plane ticket to Scotland and not the slightest clue into what I had gotten myself into. 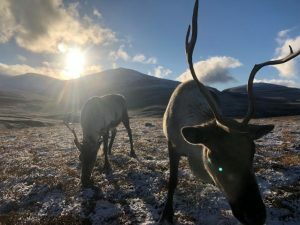 The first few days as a reindeer herder were a whirlwind of fact learning, feed mixing, and poo picking. Very different than my normal job occupation in the United States as a paramedic, I found it quite enjoyable being in an environment where no one was yelling at me or bleeding on me (hopefully). And on my measure at how successful I am at a task, I was doing very well, no one was dying! There have been several learning curves thus far that many other herders don’t generally experience. As I’ve alluded to already, my spelling of certain words has been critiqued by many of my colleagues; they are especially disturbed by ’aluminum’. Conversely, I have a particularly difficult time attempting to pronounce many of the names of the Scottish towns and hills. People have been very amused by my attempts to say them in an American accent as well. Additionally, I have never seen so many hot drinks consumed in my life! It seems like tea kettles are constantly boiling at all hours of the day! Honestly, I feel it would be more efficient to set up an IV infusion of tea for some of my coworkers! Driving on the left side of the road has also evoked a sense of paranoia that even distracts me from singing along with the radio. I find myself constantly repeating the mantra of, “left, left, left” while driving on the winding narrow backroads of the Highlands. But with the help of my fellow herders, all of these hurdles (see what I did there) have been uneventfully navigated. Often times while I blogged during my time on the Appalachian Trail, I wrote how it wasn’t necessarily the place, but the people that dictate an experience. Living at Reindeer House certainly does not fail to hold true to that theory. With seven of us from four different countries living under the same roof, from morning to night we certainly have a lot of fun. Friends that I have been with for only a month now feel like I have known them for years (in a good way). 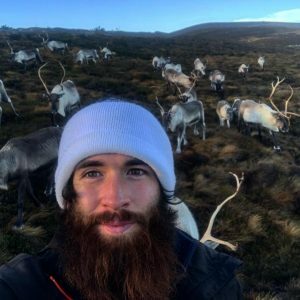 And last night the staff of the Cairngorm Reindeer Center held the first Thanksgiving in the sixty-six year history of the herd. To say my experience as a chef is limited would be an understatement. 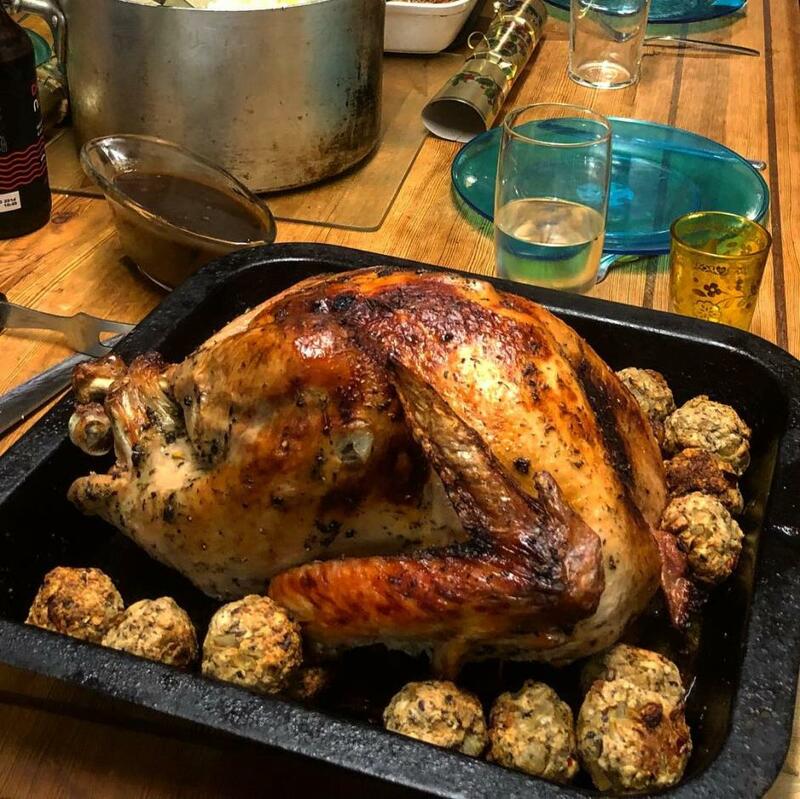 Aside from my mother’s fantastic meals, I’ve essentially lived off of peanut butter and jelly sandwiches and noodles for the past twenty-four years, cooking a full turkey dinner was an ambitious exploit to say the least. The thought of preparing a meal of this magnitude for so many people left me more unsettled than being in the back of an ambulance with a trauma patient. But with a day off and Google at my fingertips I was eager to give it a go nonetheless. Having a bit of help from Fiona and the internet I’m happy to say it all went off without a hitch and the food was very enjoyable. Everyone dressed up in their finest American attire, Fiona made an American playlist, and laughs and delicious food were shared by everyone. Even Scotty and Kate the owners of the local bar, the Pine Marten, decorated the walls with American flags, the Declaration of Independence, and many other photos of American symbols and monuments. It was truly one of the greatest Thanksgiving celebrations I have ever had with people that I am certain will be lifelong friends. Although I missed my family, this wild bunch of reindeer herders made the holiday very special for me. I think this says a lot about Cairngorm Reindeer Center and the people it attracts here. If you’ve ever come for a visit you may have noticed the kindness and attentiveness the staff has exhibited, but what you see is just a small sample of the true personality of all the herders. This incredible group of people that I have been working and living with are some of the most caring and altruistic humans I have ever met. Their love for the reindeer, their job, and each other is unparalleled to most environments I have witnessed. So from the bottom of my heart I need to thank Fiona and the whole Smith family because now I feel incredibly fortunate to also be a part of this wonderful community. I agree entirely Bobby. We have been volunteering for 3 years now, sadly had to cancel this December due to husband fracturing his ankle 6 weeks ago. All of the herders make us feel so welcome, even though we are old timers! I first visited 30 years ago when Fi was a wee one! Sorry we have missed you, perhaps another time when we finally make it. I’m sure you’ll still be there?